With the increasing migration to organic and natural products in the food industry, and particularly in the meat and poultry industry, one company is taking advantage of this large-scale trend. Applegate Natural and Organic Meats is leading the way when it comes to organic and natural bacon. And pork giant Hormel Foods Corp., Austin, Minnesota, which acquired Applegate three years ago and operates it as an independent brand, is benefiting from the consumer shift in food preferences. Sbriscia says Applegate bacon products are on-trend with what consumers want today. The company offers all its bacon products in two main lines: Applegate Naturals and Applegate Organics. Within those two lines, the bacons include both pork and turkey. “Our full product line for bacon consists of eight retail products,” Sbriscia says. They include: Applegate Naturals Sunday Bacon, Naturals No Sugar Bacon, Naturals Thick Cut Bacon, Naturals Turkey Bacon, Organics Sunday Bacon, Organics No Sugar Bacon and Organics Reduced Sodium Bacon. “What we call ‘Sunday’ bacon is our signature cut, a traditional bacon style that we sell in both organic and natural,” she says. There is also an increasing demand for turkey bacon that the company has become more heavily involved with. 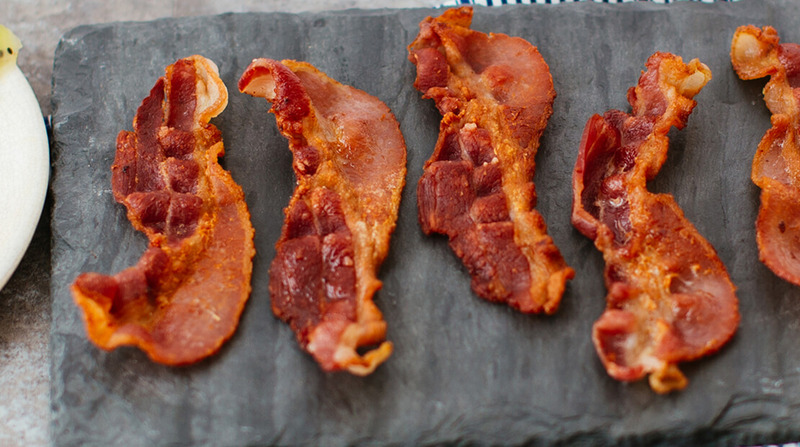 “About one-third of our bacon portfolio is turkey bacon,” Sbriscia says. Sbriscia also talks about the rapidly growing organic trend in general, and how bacon has become such a big part of it. “Organic continues to grow at retail – there’s a proliferation of organic products available that are different from what are called ‘natural’ products. Today, you see more and more mainstream retailers, not just specialty retailers, offering organic products and creating organic sets within their stores,” she notes. “The Organic Trade Association reports 82 percent of US households are purchasing organic products.” She says Applegate has been a big supporter of USDA organic regulations and requirements, although the agency has been in the process of backing away from some of those requirements.